When we look at Boston Harbor from a distance it looks like a single blue mass. But as we get to know it better, it becomes apparent how much one area varies from another-even if the two spots are seemingly close together. When we check on our oysters these differences become striking. 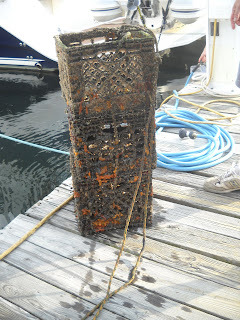 Here is a photo of some milk crates that hold a few oysters. They were first coated with barnacles. 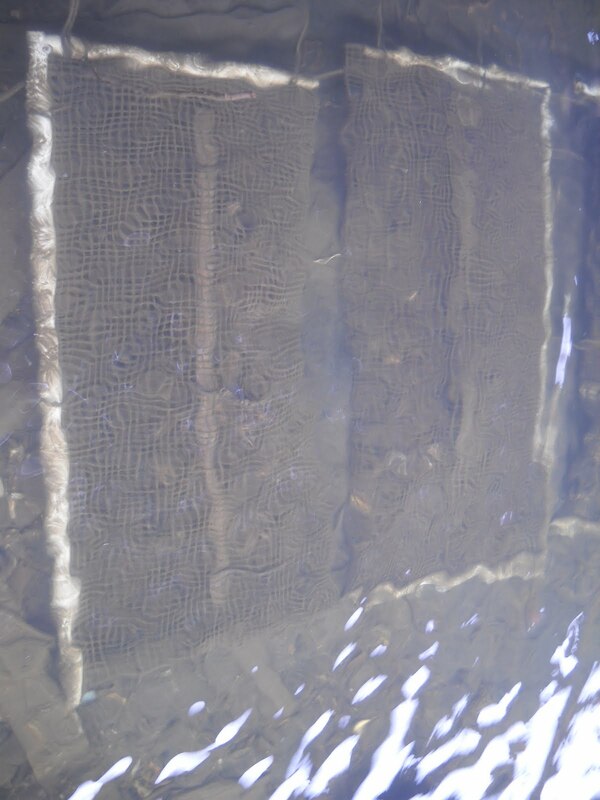 And then a matt of mussels. Yet here is another crate from 100 feet away with volunteers David Fields and Laura Olivier. There are a few mussels, but nothing like on the crates above. And here are some cages that are 200 yards away. There is no growth on them at all. We have also seen cages coated with jellied masses that the dock hands refer to as sea onions. So we are learning that there is much more going on than meets the eye. There can be silt, rock or sand floor, salty or brackish water and differing currents. 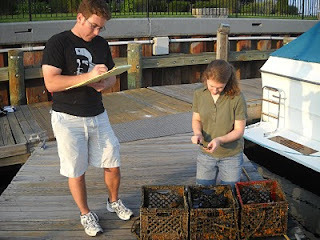 Fortunately, we are seeing that the oyster is fairly versatile and our survival data for oysters in cages is very good. 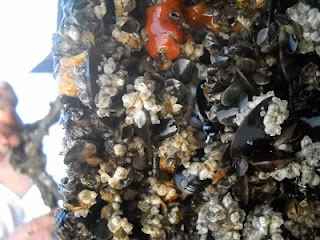 Clearly the oysters are good as the loose ones seem to attract a fair number of starfish and crabs seeking to dine on them. 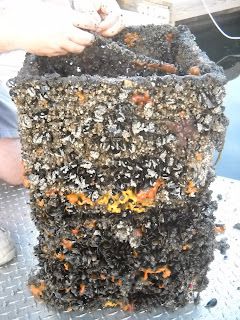 As we gain experience we are beginning to understand these underwater microclimates a bit better and seeking to incorporate this knowledge as we seek to restore the oyster to its historic home.